Months after community-investment partnership Pacific6 announced plans to convert the historic Breakers building in Downtown Long Beach into an independent hotel, the finalized vision for those plans will face the Planning Commission for approval tomorrow. Plans for the 14-story building—including details on the 14th-floor cupola and rooftop terrace that was formerly home to Cielo bar—revolve around converting the 223 existing units that were used as senior citizen living spaces into 185 hotel rooms. The most dramatic changes to the building will derive from compliance issues and the reimagining of the structure’s rooftop. 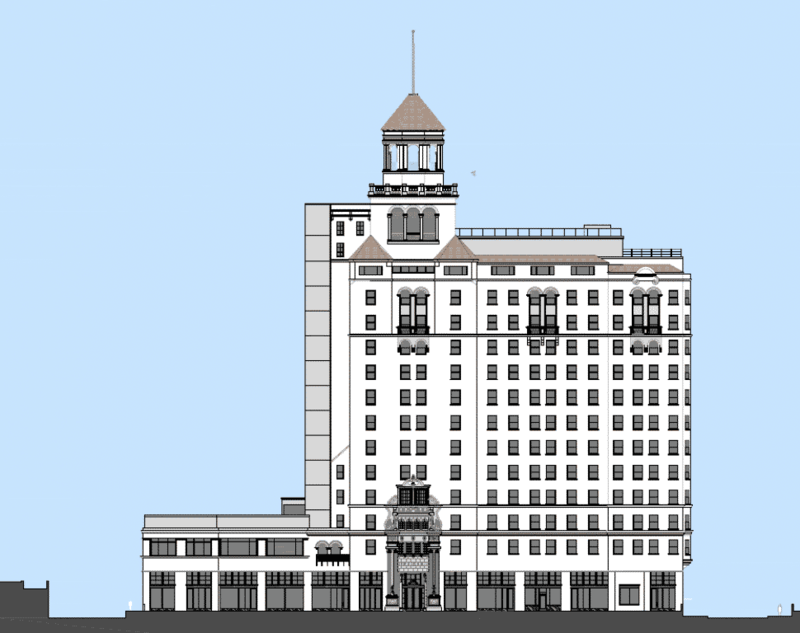 A rendering of the the Breakers building as it will look upon completion. Courtesy of Arco Construction. In order to comply with regulations, Pacific6 has to extend existing elevators while creating two new ones that will flank the building’s eastern wall. Those who visited the building’s rooftop bar previously know Cielo bar was only accessible to fully ambulatory visitors who were dropped off at the 13th floor inside the former Sky Room’s lobby. They then had to climb a tight stairwell to access Cielo. Those existing elevators will join a new passenger elevator going up to the rooftop, permitting everyone easy access the renovated top-floor space. That rooftop will obviously include the existing bar space but also expand westward onto a newly constructed 2,600-square-foot rooftop terrace. Currently, there is a 7.5-foot drop from the floor of the existing bar space to the rest of the roof. Given this, Pacific6 will create an elevated platform that will allow patrons of the bar to access the terrace by stepping down two elongated steps. A stucco wall topped with a glass railing will line the roof’s edge while a new, additional bar will be constructed at the westernmost edge of the roof. In addition, a third-floor patio/rooftop—above what will become new a restaurant space—will host a 900-square-foot pool while the small lining of Victory Park along Ocean will be upgraded with new plants and its driveway extended to exit off of Collins Way. The penthouse level on the 12th floor will feature 13 penthouse suites that range from 300 to 840 square feet. On top of this, Pacific6 plans on incorporating a coffee shop and music venue/wine bar in addition to the two restaurants and a “flex dining” space run by Executive Chef Dave Coleman. The hotel was originally built in 1926 as a private resort before becoming the eighth hotel in Conrad Hilton’s empire in 1938. The move comes after a long controversy over the building’s future purpose after it stopped being a senior citizen living space after allegations of abuse flared in 2015. It was, at one point, supposed to be a sober-living complex, but that plan eventually failed. Pacific6’s proposal, already in action as workers have been clearing the site and building over the course of the past several months, involves a complete renovation of the building through the group’s $100 million acquisition, $40 to $60 million of which will go directly into renovation costs, according to the investment group. Editor’s note: Pacific6, the parent company of the Long Beach Post, is the owner of the Breakers building.